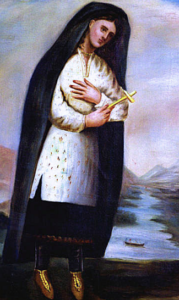 Portrait of Kateri Tekakwitha by Father Claude Chauchetière, around 1696. 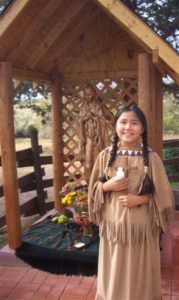 Catholic Native Americans and First Nations people of Canada recently celebrated the feast day of St. Kateri Tekakwitha, a 17th-century Algonquin-Mohawk woman who was canonized by Pope Benedict XVI in 2012. 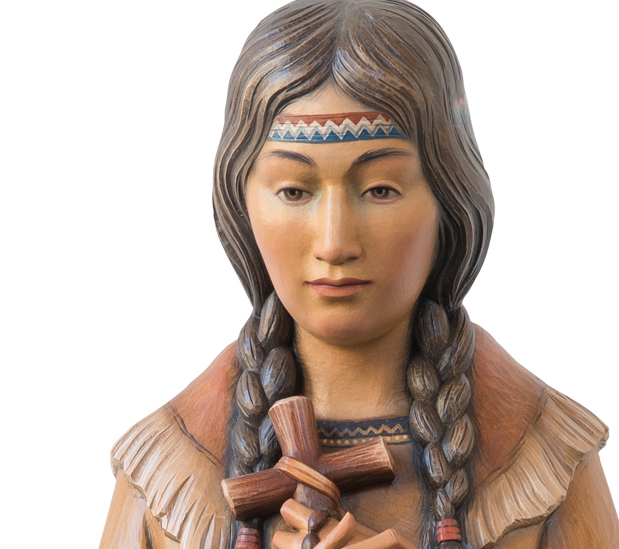 Tekakwitha was born in the Mohawk village of Ossernenon, in what is now central New York. Her family died in a small pox epidemic when she was very young, and the disease left her face scarred. She was taken in by an uncle, a Mohawk chief, and while living with him she met “Blackrobes” — Jesuit missionaries — according to some accounts. In others, a friend of her Christian mother taught her about Christ. In either case, when her uncle started pressuring her to marry a Mohawk man, she refused, citing her devotion. 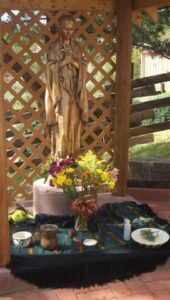 At age 19 she was baptized and took the name Kateri, from Catherine. This made her a pariah in the village. On the advice of a priest, she fled and walked 200 miles to a Christian Indian village at Sault St. Louis, near Montreal. That’s where she became known as “Lily of the Mohawks.” She prayed, attended Mass and remained chaste until she died at age 24. Legend has it that upon her death, the scars on her face disappeared. The statue in the photo above is one of several available from Mazzolini Artcraft and our partner Art Studio Demetz. 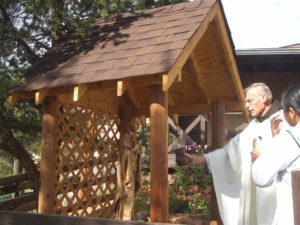 The photos below are from the dedication of a St. Kateri shrine featuring a statue that Mazzolini provided for Our Lady of the Blessed Sacrament Church in Fort Defiance, Arizona.